Biomed Design Validation is used at the stage where a design that has been developed from the, VMP / URS /GAMP 5 / cGMP / and other Health and Safety Guidelines, is reviewed and documented by competent persons to ensure that the designed equipment, if built, will satisfy all the detailed specified requirements. Validation Online has documented many times before the importance of paying attention to ensuring testing and inspection stages are traceable back to user requirements. Well here we are again; you have taken great trouble to write, and get approved a URS and a VP, now a vendor (or could be in house) has come forward and presented a design that they have prepared, and they state it will satisfy your requirements. The FDA maintain; that this is the stage where the great majority of project problems are manufactured, not obvious immediately, but materializing later in the project time line. The Design Qualification is the only document that is going to confirm that the design will work. It must be carried out by qualified people who can challenge the design performance. If you have no such persons on your staff you must contract them in, or contract the DQ out. BIOMED DESIGN VALIDATION IS AN ESSENTIAL STEP IN ACHIEVING SUCCESS IN ANY VALIDATION PROJECT. A DV can also be used where a company has prepared a User Requirements Specification (URS) for a piece of equipment and is searching for a manufacturer, but is offered equipment Of-The-Shelf. A DV can be used to verify whether the off-the-shelf item will fully deliver the functionality specified in the URS, whilst complying with all relevant cGMP requirements and all applicable health and safety issues. 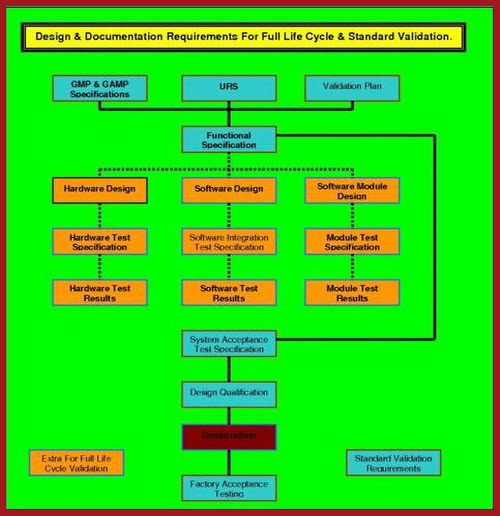 Verification that the design is cGMP complant and where software is used, conforms to the requisit life cycle model requested in the VP and detailed in GAMP 5. Verification that the system will be calibratable. DV In The Validation Process.